A time to recognize, celebrate and thank the 450 volunteers that make a real difference in the lives of our patients, families and staff at the Montreal Children's Hospital (MCH). 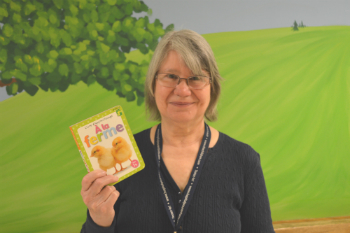 “I don’t think I’m doing very much but they seem to appreciate it so much and that gives me great satisfaction,” says Margaret Annyas about donating three hours a week to help patients and families at the Montreal Children’s Hospital. 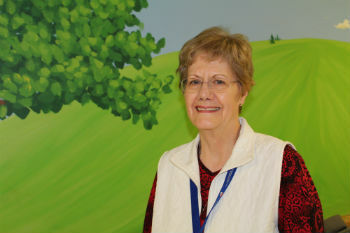 For the last 7 years, Margaret has been volunteering in the Emergency Department (ED) as part of the Help Me Find My Way program. Her role is to help families better orient themselves and find quick answers to their questions and to assist families coming through the door with young children by carrying their bags or pushing a stroller. Margaret was retired when she met fellow MCH volunteer, Liz Gibbon, who convinced her to become a volunteer. The rest, as they say, is history. At the end of the day, Margaret says the best compliment is when nurses tell her “I wish you were here every day!” on her way out the door. What’s not to love about being helpful? “It’s reassuring to be able to help people,” says Liz Gibbon, who celebrates 10 years of volunteering at the Children’s this year. Liz has volunteered in a number of departments from the time she began volunteering once she retired in 2005, beginning with documentation of archives and most recently in the Emergency Department. Liz helps parents find their way throughout the hospital and is also there for patients, adding that she always makes sure to bring a picture book with her during a volunteering shift. “If the child is nervous, I can show them the book and it basically distracts them,” she says. In the cold winter months, Liz asks parents to remove their children’s coats so the triage nurse can properly assess each child. While she delights in interacting with patients, she admits the best part of her day is when she can see a child on the road to better health. “It’s great to see children going home,” she says. 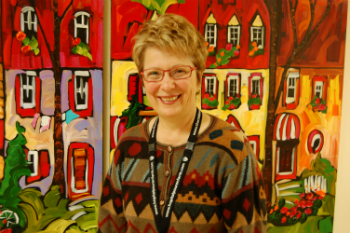 Johanne has a great deal of experience working in pediatrics. She previously worked as a volunteer nurse in Bolivia for two years. Once she returned to Montreal, she wanted to continue working with children as a volunteer. Johanne works primarily in the Intensive Care Unit. She accompanies patients and participates in their daily activities, whether it be singing, playing or reading with them. She describes the patients she works with as "little balls of happiness" with whom she creates a lasting connection.